Dowd and Kessler are NJ State Champs! 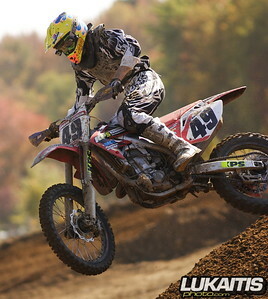 Raceway Park in Old Bridge Township played host to the 23rd annual NJ State Championships presented by Suzuki on October 19th. The race was moved from its traditional summer date to a mid-October date in order to be a qualifying event for the Tri-State Race of Champions. The Tri-State Race of Champions will take place at the beginning of November at Walden MX and feature the top racers in each class from each of 3 qualifying races, the NY, PA, and NJ State Championships, to determine the Tri-State Champion. Sunday’s NJ State Championships took place under typical northeast fall weather. Crisp cool temperatures greeted the 500 plus riders in attendance and since this was the last race of Raceway Park’s season everyone wanted to end on a high note. The first Open Expert moto of the day saw Fox backed Honda rider Adam Blessing grab the holeshot and the early lead. He was followed up “the staircase” by Moose Suzuki rider John Dowd and Thor/Dragon backed Honda rider, Anthony Roth. When the lead pack came over “the plunge” on the first lap it was still Blessing, Dowd, and Roth but they were joined by Raceway Park track champion KPS/MCC backed Dakota Kessler and Suzuki mounted James Decotis. Early into lap number 2 Kessler made his move on Blessing and tried to check out on the field. Meanwhile, Roth, Dowd, and Decotis were locked in a battle swapping positions with each other on a turn by turn basis. In the end, Kessler held on to take the win followed by Blessing, Dowd, Decotis, and Roth. Roth grabbed the holeshot ahead of Dowd and Decotis while the top 2 riders from moto 1, Kessler and Blessing, suffered from poor starts and would be forced to work through a very fast pack of racers. 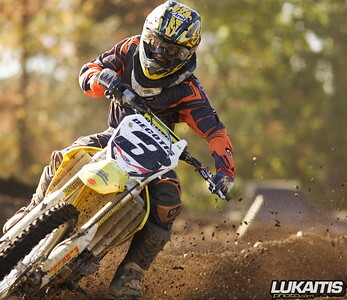 The Suzuki trio of Dowd, Decotis, and Stewart remained close for the moto and would finish in that order. Blessing made a run on Stewart but would fall short at motos end and had to settle for fourth. In the end, it was Dowd’s 3-1 moto scores taking the overall followed by Decotis (4-2) in second and Blessings (2-4) for third. 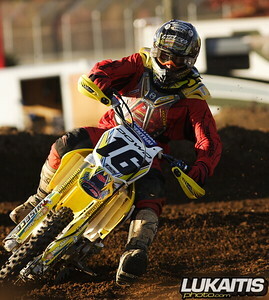 First moto winner Kessler would go (1-5) for fourth overall and Stewart’s (7-3) rounded out the top 5. Dowd would grab the holeshot in the first 250 Expert moto followed closely by Kessler, Decotis and Ocean County Powersports rider Ronnie Stewart. Dowd tried to make a pass at the end of the first lap but Kessler held off the former Supercross Lites Champion. Dowd got by the hometown rider and the two went on to battle for the lead. 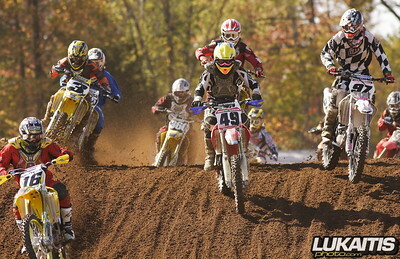 The two riders went on to battle Kessler eventually getting the upper hand to take the lead and moto win. Decotis also got by Dowd to go on for second with Dowd settling for third. Moto two Dowd again out front with the holeshot followed by Stewart and Kessler and the rest of the field. Dowd began to gap the field and even survived a late moto charge from Kessler to hold on for the moto victory. Kessler would finish second and Decotis would take third. Kessler’s (1-2) motos would be good enough for the overall followed by Dowd (3-1), Decotis (2-3), Stewart (4-4) and Michael Stryker (6-5) rounding out the top 5. Raceway Park ended the 33rd season on a high note with great weather and excellent racing.